Sunday the 29th June was another early start for Phil, Bradley and myself. Phil was tending his flock including doing his pre-flight check on the Huey whilst Bradley and I headed up the M55 towards Blackpool . 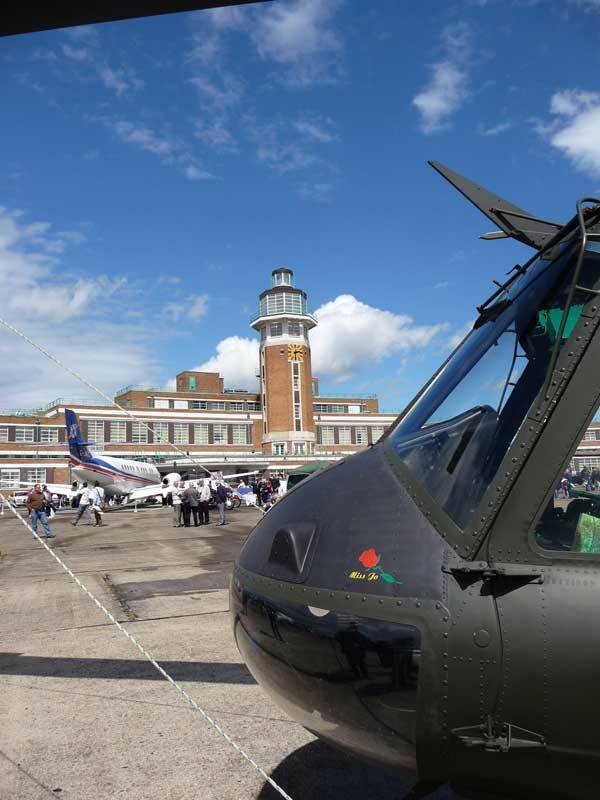 We had had a little longer in bed as 509 was at Phil's after the Lytham Club Day event as opposed to Blackpool Airport which often delays our departure time. We arrived around 7:30 a.m. to allow time to load the .50 cals in the back and to check the forecast and for any Notams that might affect us. We also studied the maps and photographs of the site we were flying into, namely the apron in front of what is now the Marriott Hotel but was once the Art Deco Terminal Building of Speke Airport. All seemed in order so Phil put his calls in to the Event Organiser and Blackpool ATC. 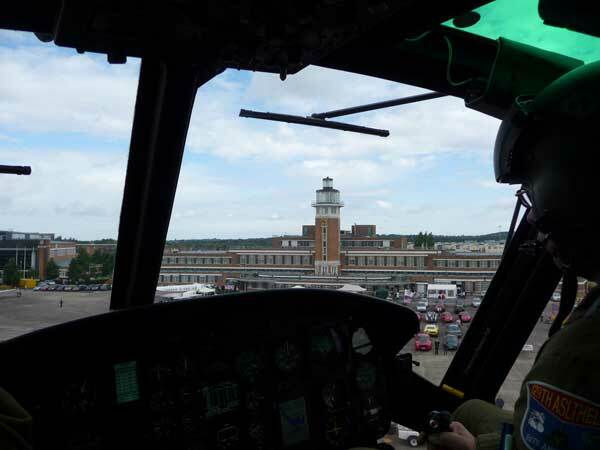 We were flying to Speke for the ‘ Liverpool Airport 75th Anniversary Celebration & Speke Aviation Fair 2008'. The Aviation Fair is an annual event for the Jetstream Club, Speke which had been brought forward in their calendar so that the event could also celebrate the 75th Anniversary of the opening of the Liverpool Airport in July of 1933. There was to be static aircraft on the ground along with classic cars, military vehicles and other attractions including an 'air fair' for want of a better description, more of that later. Happy we had sorted everything we walked out to 509. Phil jumped in the right seat whilst Brad and I untied the rotors. I jumped in the left hand seat and Bradley walked the rotors around three times to circulate the oil, once he had done that he parked the blades at 90° to the fuselage. Phil and I went through the now familiar routine to start the turbine whining. Bradley stood outside connected to the comms so we could talk to him as we went through the start up sequence and for him to check around the outside of the aircraft making sure everything was secure and our two front doors were shut and in the locked position. Satisfied we were okay, Bradley jumped in the back and Phil radioed Blackpool ATC. We took off at 9:25 a.m. and turned south towards the Ribble estuary. We crossed the centre line of Warton with no activity on the ground and headed out over the estuary and Southport . We double checked the radio frequencies and Phil put a call into RAF Woodvale. Although not manned at that time our call is logged so they know what traffic has been in the area. As we approached the airfield we spotted the rotor on the Merseyside Police Helicopter were turning. Phil put a call into Liverpool Airport ATC who were expecting us. They warned us of activity at RAF Woodvale which we acknowledged as we already had a visual on the Police Helicopter on the ground. 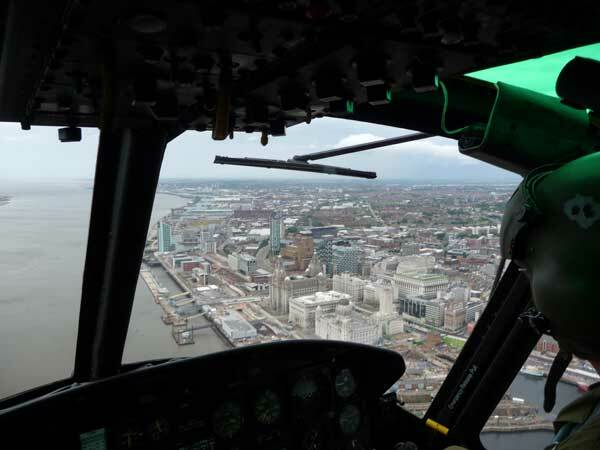 No sooner had we had spoken to Liverpool ATC, the Police Helicopter put their call in as they were flying to Speke as well. 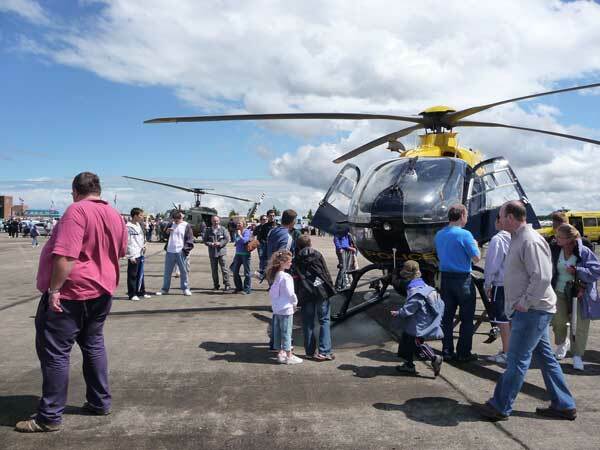 They decided they would follow us to Speke so Phil asked if they wanted to go ahead of us as they were quicker - funnily enough they insisted on following us (so they could admire the Huey in action all the way in ….. we have fans everywhere!). 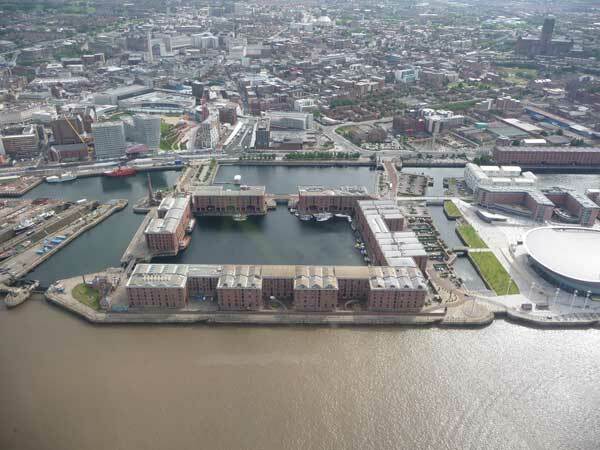 As we approached the Seaforth Docks we put another call into Liverpool ATC as requested and they gave us the all clear to continue south advising of another aircraft in the vicinity. Again we radioed them when we had a visual. All the time we were flying Bradley was keeping an eye out for the Police Helicopter. His commentary went something like this “He's at 5 o'clock … now at 4 … I can't see him …oh yes I can, he's now at 8 o'clock”. They were obviously enjoying flying around us. Later we were to find out they had also been using their onboard camera. As we approached Garston we called the ATC and they gave us clearance to head for Speke with the police on our tail. 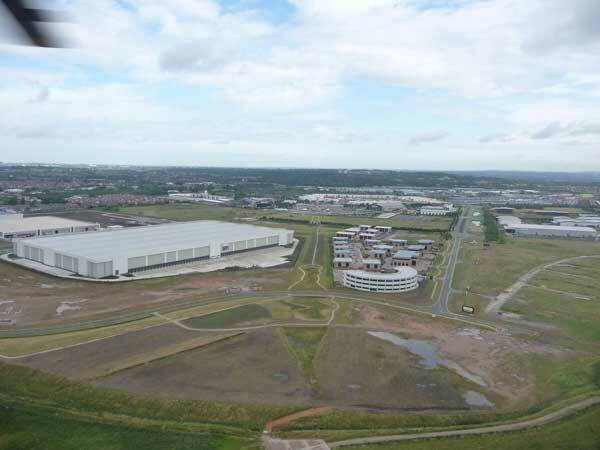 We approached around the new build warehouses/offices on the east of the old runway. Once round the back Phil then pointed the nose of 509 towards the south western end of the old terminal building. On the ground we spotted the Marshall who was to guide us in. Close to the perimeter fence to our left was the Jet Ranger that was giving pleasure flights so we kept a close eye on it as we descended. As we crossed the perimeter fence we kept a keen eye out to our right as our downwash was beginning to show its strength. As soon as we touched down at 9:56 a.m. Bradley jumped out of the back and patrolled around the side of the Huey to make sure no one tried to approach whilst the blades were still turning. The moment the blades had stopped the crowds were around us. I had to walk the blades to line up the tail rotor so we could secure it to the tail boom to stop it flapping. Not an easy thing to do with so many people around the machine. Phil and Bradley attached the .50 cals to the pedestals, all the while answering questions eagerly asked by those crowded around. For the next 3 hours the three of us fielded all kinds of questions about this unique helicopter. 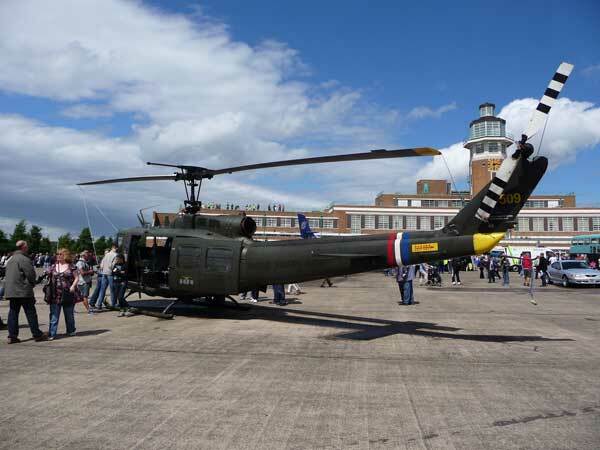 Some were visibly affected by what they heard of the history of 509 and its work and recent re-acquaintance of Vietnam Veterans who served in the 129 th AHC. The weather was overcast and there was a chill wind but there were signs of possible rain which eventually arrived at lunchtime. We decided to shut the doors and headed for some shelter and a bite to eat and a drink. Suitably refreshed Phil and Bradley headed back to 509, I on the other hand headed inside to have a look around the 'Aviation fair'. Everything related to aircraft and aviation for the enthusiast was to be found including parts of old aircraft, gauges, dials, models, magazines, videos, DVD's and books. There were stands for people to join various organisations and to book their pleasure flights that were being flown from Liverpool John Lennon Airport . I had ‘a butchers' at the stalls and spotted a book that looked interesting. It was a compilation of 3 books looking at ???? 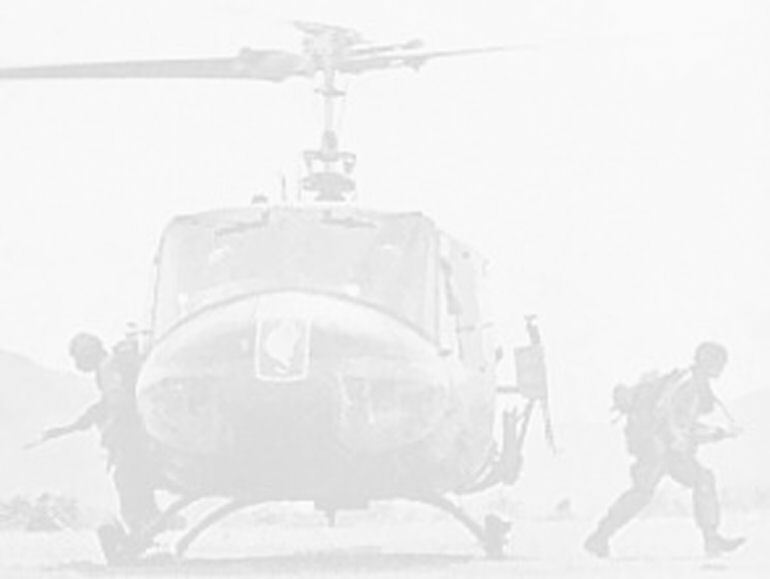 …….you've guessed it, Huey Gunships, Cobra's and the OH6A or Loach as it was called. I picked it up and the stall holder immediately handed me two other related books, one was the history of Dust Off. So Dust Off and the Gunship book were duly purchased. Pleased with my new acquisitions I headed back to the Huey (Phil later claimed that I ‘nabbed the books before he had a chance' but I strongly dispute this!). Phil and Brad were in the front seats and soon were looking at the gunship book. I had a closer look at Dust Off and the work of the Medivac crews. All the while the rain continued to fall outside. Undeterred there were plenty of people outside having a good look around the helicopter. They got the shock of their lives when they peered in through the windows to see us sat in it!! Thankfully around half an hour after it had started to rain it eased off and the sky began to clear. We jumped outside and opened up the doors. What an affect that had. All of a sudden we were swamped with people. It was as if they had lain in waiting for their moment to pounce. We had a real laugh talking to those that came to admire 509; many soaked to the skin in their shorts and t-shirts but they were soon to dry out as the temperature rose and the sun shone. 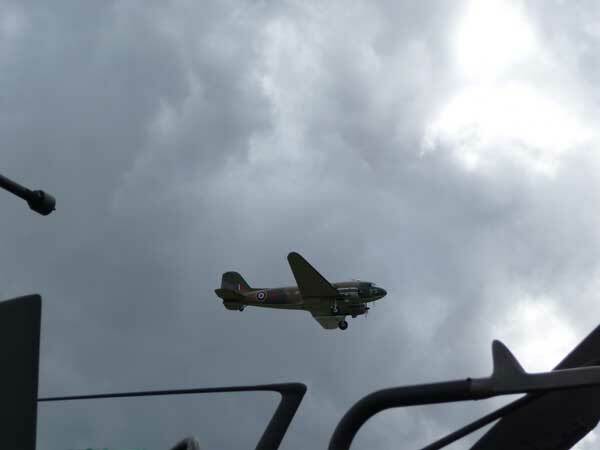 It was at this point that everyone gathered around on the old apron were treated to a flying display by the BBMF's Dakota. Unfortunately it was the only aircraft of the BBMF to have made it to Liverpool . The Lancaster , Hurricane and Spitfire were unable to make the trip. As nice as the weather was there was a change in the sky to the north west of us and we decided that we had better make a move to prepare 509 to fly. Phil called Neil Airey who was on duty with the NWAA and he provided the latest on the weather. It seemed like the right time to make a move. We took the .50 cals off and strapped them down in the cabin along with anything else we didn't need. 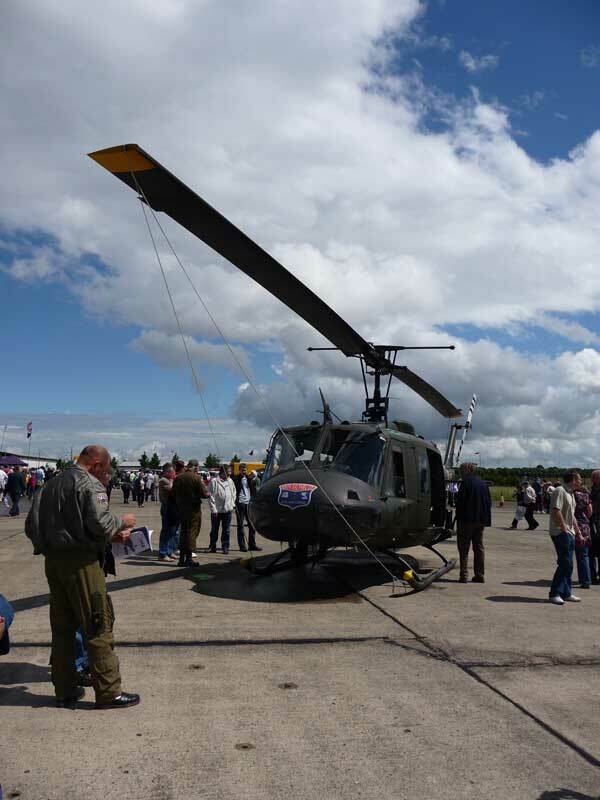 The Marshalls moved the crowds back and the rotors were untied. The engine spooled up and Bradley did the honours with the walk around and hopped in the back and strapped himself in. We left Speke at 3:30 p.m. and the flight was against a head wind which slowed us down somewhat. Between Woodvale and Southport we hit a spot of rain but we were soon through it. Across the Estuary and we were on our approach to Blackpool Airport . There was a slight delay in getting to Helipad 3 as there was a lot of light aircraft movement. We could physically see the fuel gauge dropping as Phil kept 509 in the hover. Eventually he popped it on the ground as we had been hovering for so long and we got the call to cross the field and to put her down on Number Three. We had asked for fuel so we topped up the tanks before putting 509 back in the hangar for safe keeping. It all sounds so straight forward but waiting for this and that happen took nearly another two hours until we could walk out of the hangar. And so, the end to another good day in which many got a chance to get even closer than normal to 509.